Refugees and migrants, who entered Macedonia from Greece illegally, walk between the two lines of the protective fence along the border line, near southern Macedonia's town of Gevgelija, Feb. 29, 2016. The United Nations warned Tuesday that Europe is near a "self-induced humanitarian crisis" because governments are imposing border restrictions and failing to work together as migrants continue to reach the continent. Adrian Edwards, a spokesman for the U.N. refugee agency, said more than 130,000 people have crossed the Mediterranean this year, most of them reaching Greece. The two-month total is near the figure for the first six months of last year. Some 24,000 refugees and migrants are in need of accommodation in Greece, with around 8,500 of them massed next to the border with Macedonia. Macedonian police fired tear gas to push back refugees trying to cross the border from Greece on Monday in the latest clashes between people seeking to move through Europe and governments trying to control the flow of people into their territory. The UNHCR urged Greece and Balkan countries to quickly act in order to prevent a disaster. Edwards said European nations pledged last year to accept more than 66,000 refugees who reached Greece, but that so far only 325 relocations have taken place. He said Greece cannot manage the situation by itself. European Council President Donald Tusk is visiting Austria on Tuesday as part of a five-nation trip to work on how to handle the migrant crisis. 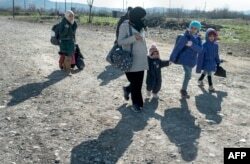 A woman and children cross the Greek-Macedonian border near the town of Gevgelija, Feb. 25, 2016. Merkel has said an EU solution cannot be done in a way that abandons Greece. Austria has held firm to its policy to cap the number of migrants it allows into the country. That, in combination with measures set up by others further south along the migration route, has led to bottlenecks at borders. Those restrictions have drawn sharp criticism from human rights groups, the United Nations and others in the EU, particularly Germany. "When one country defines its limit, another must suffer," German Chancellor Angela Merkel said Monday. "That is not my Europe." Also Tuesday, crews in Calais, France continued dismantling part of a sprawling camp as a group of migrants protested and police kept watch. The site has served as a home to migrants hoping to make their way in Britain. It had grown to house an estimated 6,000 people in December and has since dropped to about 4,000 people. "It is a global challenge and it is not somebody else's problem," he said. "It's a test of all of us." He highlighted the "unbelievable burden" shouldered by Turkey and other Syrian neighbors Jordan and Lebanon. Together, they are currently hosting nearly 4.5 million Syrian refugees. But their struggle to provide for such a big influx has led many people to seek a better life in Europe where governments have been wary of admitting too many newcomers.